When the grocery stores had baking supplies on sale before Christmas I bought a few bags of various chips for cookies. They had been in the cupboard for almost three month and I wondered what to make with them. Then I remembered the Oatmeal Scotchies recipe from Mommy’s Kitchen. I’m the only one who likes butterscotch chips so I adapted the recipe using a mix of chocolate and peanut butter chips and made it into bars instead of drop cookies. The tweaks turned out fabulous. I think this is my new favorite cookie. Preheat oven to 375 degrees. Mix together flour, baking soda and salt in small bowl.In a large bowl cream together butter and sugars together. Add eggs and vanilla and beat until mixed thoroughly. Slowly add flour mixture and mix until just combined. Stir in oatmeal and chips by hand. Grease a jelly roll pan and spread mixture to the edges. Bake for 18-22 minutes or until golden brown. Cool completely in pan on wire rack. Cut and serve. Mmmm, these sound good! And quick and easy, which is my kind of recipe 🙂 I’m printing this one to make for my kids. Thanks for stopping my to see my Jello Pudding Cake. I’m off to go check out more of your blog! Thank you for your visit and lovely comment Jennifer. My family would love this combination of chips better too. Sounds double delicious! These sound wonderful. Love the peanut butter and chocolate chip combo. 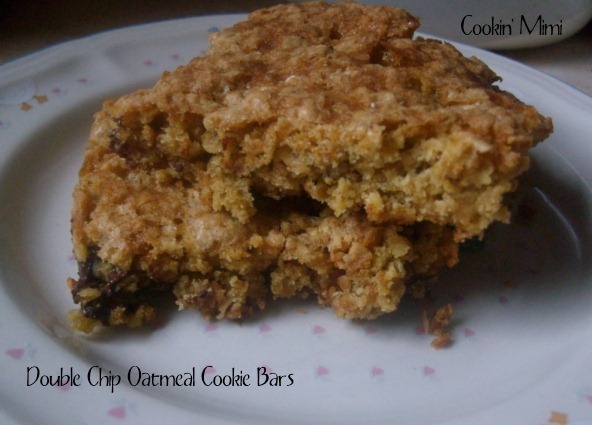 I’d like to invite you to share this recipe with my linky, Sweet Tooth Friday. I hope to see you there. Chocolate and peanut butter chips sound fantastic in these. Maybe I missed something? Jelly roll pan – how big is that? 9 x 13? 8 x 8? Are they all the same size? A jelly roll pan is usually 10×15 inches.